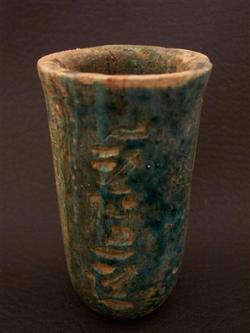 your bidding on ancient egyptian royal wine cup with hieroglypic inscriptions on it.in great condition .made from faience ,during Dynasty 17,The detail is symbolic to the artistry displayed by the ancient Egyptian craftsmen.purchased from An antique dealer. 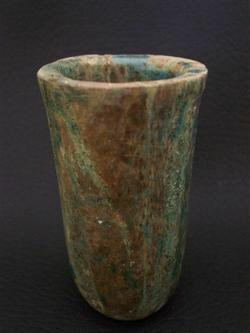 `Culture-Period --->Egypt, 2nd Intermediate Period, Dynasty 17 `Appearance Dating --->1640 BC1600 BC `Origin ---> Land of the Pharaohs Egypt, Upper Egypt`Size --->Tall 7.7 cm(3 inch)xcircumference13.4 cm(5 1/4 inch `Composition ---> Faience. I obtain my items from various sources (antique dealers some of those dealers have been working in this business since 1930's and 1940's) private collections and or estates), We have received all information regarding our items from second hand sources, and the timeline set on our items is to be used as a guideline for the above period listed. Since I am a collector myself I tend to take pride in the items I aquire. These pieces are wonderful and we present them as they have been represented to us .